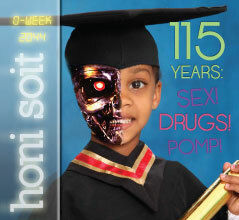 Honi Soit is the weekly student newspaper of the University of Sydney, Australia. Published since 1929 by the Student’s Representative Council (SRC) at the University of Sydney and distributed around campus free for all students to read, Honi Soit has a colorful and sometimes controversial history but has a proud reputation of being the most vibrant and prestigious student publication in Australia. It is also, in 2012, the only weekly student publication in Australia. Our alumni of famous and infamous student editors have produced some of their more interesting and controversial work in the pages of Honi Soit. Many have gone on to become leaders in the arts, journalism, law and Australian politics. Honi Soit is produced by a team of student editors, who are elected by the student body in the SRC annual elections. They receive professional training and support from the SRC Publications Managers and manage a group of student reporters and contributors that help create over 20 pages of weekly content. Honi Soit commenced publication in 1929 under the auspices of the then Sydney University Undergraduates’ Association (now the Students’ Representative Council), to counteract the mainstream Sydney press who had set about demonising University of Sydney students after one Commemoration Day got a little out of control (it was only the Cenotaph. after all). This is also the origin of the name, Honi Soit, which is short for the Old French phrase, “Honi soit qui mal y pense” (“Shame upon him who thinks evil of it”), the motto of the British Order of the Garter. Commem. Day, a fine University tradition that ran up until the mid 1970s, involved a grand parade from the University grounds up to Town Hall in which different faculties and societies manned their own floats, and young rapskalions waged havoc upon conservative Sydney with bold pranks of varying tastefulness. The day was not only a celebration of youthful exuberance but also a lynchpin in the nascent University community. Ever since its inception as a defence of Commémoration Day, Honi Soit has continued to be a reflection of this community, both in its successes and times of trial. If you would like to Advertise with Honi Soit please check out Advertising Information Page. In 2010 Honi Soit entered the digital age by launching its own website as well as a profile on Facebook. In 2012 Honi Soit Editors decided to upgrade the existing website to further push Honi Soit’s online presence with this website that is both tablet and mobile friendly. Honi Soit has a heavy social media presence today, actively engaging online conversations through its popular Facebook Page and sometimes controversial Twitter account. The popular Commemorative Edition, published October 2006 is a great summary of Honi Soit‘s publishing history with some of the major editorials and articles republished and highlighted throughout the paper. Download the PDF and enjoy. Nikolas Kirby and Evan Williams, Editors-in-chief, Commemorative Edition 2006 Honi Soit Commemorative Edition PDF Download. Honi Soit is supported by the Students Representative Council at the University of Sydney. Run by students for students since 1929, the SRC offers undergraduate students confidential advice, affordable books, emergency loans and other student services. The SRC represents undergraduates within the University of Sydney and the wider Australian University community. The SRC’s operational costs, space and administrative support are financed by the University of Sydney. Honi Soit is printed under the auspices of the SRC’s directors of student publications. All expressions are published on the basis that they are not to be regarded as the opinions of the SRC unless expressly stated. The Council accepts no responsibility for the accuracy of any of the opinions or information contained within the newspaper, nor does it endorse any of the advertisements. The editors of Honi Soit would like to acknowledge the traditional owners of the land which the University of Sydney is built upon, the Gadigal people of the Eora nation.